Jenean manages an enterprise sales team for a rapidly growing technology company. She sits in Seattle with half of her team selling out of the Seattle office. The other half of her team, however, sells out of a Boston office, and one of her sales reps works in London. This is not some rare occurrence. A distributed work force, nationally and internationally, is now common practice. But that’s not what makes organizational life so challenging for Jenean. What makes it so challenging are the dotted lines. Jenean works with a marketing department in Chicago. She’s responsible for providing qualified leads to her salespeople, but has no direct authority over marketing programs, practices, or personnel. Jenean also works with a software and service team in Israel. Again, she’s responsible for deals that close to actually stay closed and not fall apart in implementation, but has no direct authority over this group either. 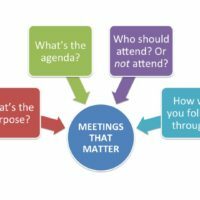 It’s a popular notion that the complexity of organizational life today arises from the international setting in which businesses operates—Seattle, Boston, London, Israel. While this can be daunting, it’s often overcome by frequent trips and the latest technology. The real challenge—the one that no one’s talking about—is the dotted line challenge. The places in our work where we’re held responsible for results but have no direct authority to secure them. The first and fundamental problem that occurs across a dotted line is a complete lack of clarity around what needs to be done. In a direct line the potential exists, at least, for someone to enunciate measurable outcomes. In a dotted line, no one feels comfortable doing that because they’re not “the boss” and don’t want to be perceived as being bossy in any way, shape, or form (For, alas, that would be socially unacceptable in today’s politically correct culture). As a result, critical expectations are left unexpressed and pressing business needs unaddressed. In this fog you can lead. In fact, you must. Not by taking on the role of “the boss,” but by being very clear about what you need. Reaching out with an open hand to your internal business partners and asking them to join you in getting something specific done. Making your request, specifically and respectfully, is the first secret to leading across a dotted line. The second one is this: explain why. “Excuse me, I have five pages. May I use the copy machine?” Received a 60% response rate. “Excuse me, I have five pages. May I use the copy machine, because I have to make copies?” Received an 83% response rate. “Excuse me, I have 5 pages. May I use the copy machine, because I’m in a rush?” Received a 94% response rate. The conclusion? Most people, being social creatures, want to help others out. We’re wired for why. By explaining your why, you’re giving someone a chance to act in a way that’s aligned with their basic humanness. The formula for doing this is simple, as illustrated in the research study above. 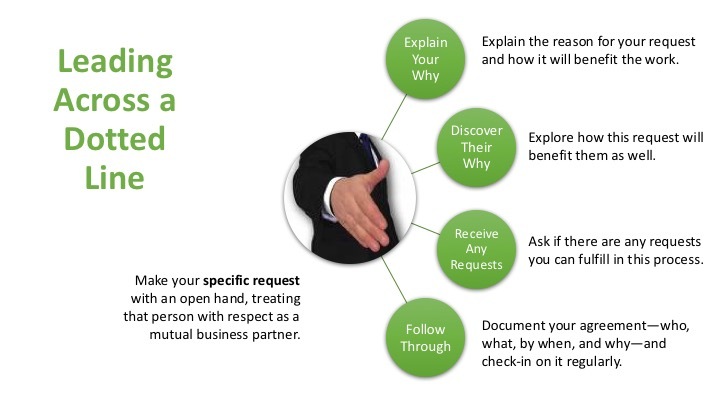 Make your request followed by the word “because …” Then give the reason behind your request. The how you are requesting may be hard, even difficult, but by exploring its why from another person’s perspective (not just your own), you unlock a deep, untapped reservoir of motivation. Human beings are not robots. We need reasons for the things we do. Your why gives an altruistic, others-centered reason. Their why appeals to enlightened self-interest. Both work brilliantly together. This fourth secret turns the tables of the conversation. Until now you’ve been explaining your requests and the reasons for them, now it’s time to explore any requests that may be made of you. The way to do this is simple and straightforward. Ask, “What can I do for you and why?” Ask it in all honesty, completely prepared to answer it, and not as a manipulative trick. At which point I say, “Done!” And make sure it happens. Some requests will be much more involved than that, but at least expectations are on the table, out in the open, and you have a chance to work on them together. Remember, lack of clarity is the biggest derailer in working across a dotted line. You’ll notice a balance between advocacy and inquiry in these first four secrets. This is a key theme in my work. Advocacy only and we drive people away in one-way conversations and one-way relationships. Inquiry only and we become hopelessly accommodating, a doormat to anyone’s demands. Neither option works across a dotted line. The key is clearly explaining your point of view and honestly exploring the point of view of others. Then reaching an agreement that both of you can fully support. Advocacy and inquiry allows you as a leader to use the power of influence instead of the power of enforcement, a much more effective use of power, for “a man convinced against his will is of the same opinion still.” Influence, then, will quickly become your go-to method for leading in any organizational role, dotted line or direct, because it inspires people to follow you freely. Frankly, you could complete all the previous four secrets faithfully and have your agreements completely fall apart. Why? A lack of follow-through. “Follow-through is the cornerstone of execution, and every leader who’s good at executing follows though religiously,” declares best-selling authors Larry Bossily and Ram Charan in Execution: The Discipline of Getting Things Done. This is a simple but universally ignored practice. After an advocacy and inquiry conversation, write down the decisions made by detailing who’s going to do what by when and why, and distributing those details to everyone involved. Who’s going to do what by when and why? Having documented your agreement in this way, revisit that agreement on a regular basis, every week or every month. Not as a boss but as a workout partner. Both bosses and workout partners provide accountability, and both help us become the best version of ourselves. You’re using the latter because you’re not in a position to use the former. Either works amazingly well, because accountability accelerates performance. This morning I was on a call from my office in Oregon with a sales manager in London, as a sales leader he interacts with joined us from the Midwest. We spent most of our time talking about members of his sales team who work in the Netherlands, one of whom had moved there from France. This is the brave new world in which we live and work. But it’s a fairly simple world compared to the dotted lines that give us responsibility without authority. Master these five secrets and you’ll thrive in the midst of increasing complexity.